This definition is rather at odds with a work world I love -- but, I suppose that if you have a sense of humour, watch Scandal and read this with a glass of wine, you can make it work. For me, though, a simple "willingness to engage in controversy" seems a more apt definition. 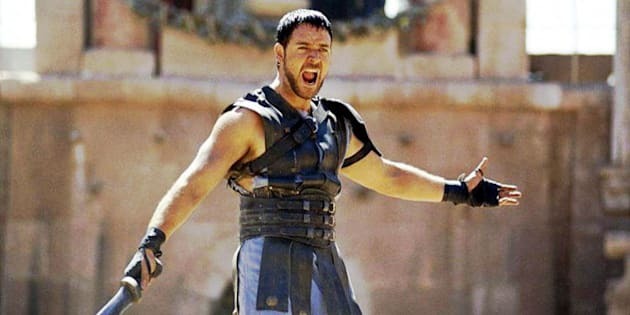 Every big workplace needs gladiators -- a few people who are prepared to fight to bring new ideas to life, to put an end to bad policies and to generally challenge the status quo. For even with the best intentions to embrace innovation and enable high productivity, large organizations can be tough places to get things done, especially if you're piloting a new idea or promoting a different way of doing things. These corporate gladiators are happily "captive" in the workplace and willing "slaves" to work, a company and people they love. Their "weapons" include their networks, in and outside the "public arena," and possibly some investment capital, a.k.a., a rainy-day fund designated to cover a cost overrun but which can also be used to make a good idea happen. Their titles rarely involve the word gladiator, but they tend to begin with "Chief," in recognition that they often have a team of people who are prepared to donate weekends to work on their projects. They fight -- or "agitate," as someone I know calls it -- in the public arena of a workplace, which can sometimes feel like wrestling a "wild animal." And many a time there are entertained spectators in the wings, watching to see if the gladiator can "pull this one off." Fortunately, this isn't ancient Rome, so even when corporate gladiators don't win, they go on to fight another day. No matter what the outcome, it's always a spectacular show. And it's fun to be on Team Gladiator, where there is a sense of pride in knowing you leaped into the action to battle for good. Do you occasionally feel that you're going into battle as you head to a meeting, but know that you have right on your side? If someone says "no," do you reframe your question because you assume they simply didn't understand it? Do you get a rush of adrenaline when you are preparing to pitch your idea, armed with facts, figures, courage and a hidden network of supporters? Do you have a group of gladiators-in-training you can depend on, people who will give up a weekend or an evening to brainstorm an idea with you for little more than the cost of chocolate-covered espresso beans? Do you know people who will always find $10,000 or $100,000 to fund your venture? Do you watch Scandal and dream of being Olivia Pope -- not just because she can pull off a white suit after Labour Day but because, despite the odd missing body, she can inspire a team of people to fall into line and make a PR war look like fun? If you answered yes to more than a few of these questions, then join me in adding gladiator as a new expertise on LinkedIn!